Morgan County Commissioner Bob Ford is concerned that the old Sheetz property at the corner of Rt. 9 and US 522 will remain vacant — an eyesore in the middle of town. Ford says he has seen a pattern of Sheetz in the Hagerstown area holding on to old properties to keep competitors out. But Sheetz real estate site selector Brian Dinges says — not so. 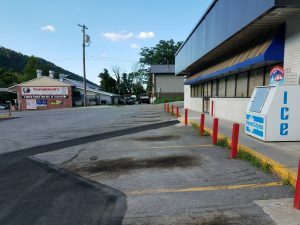 Dinges says that Ford might be referring to an old Sheetz in Williamsport, Maryland which has been donated to the town — and the town has yet to develop it. Or one in Hagerstown where Sheetz is trying to give it to the city — but the details have yet to be worked out. “We had one in Altoona and sold it within two years,” Dinges said. The tanks have to be pulled out from underground and the facility has to pass an environmental inspection. That’s what has been going on now at the old Sheetz in Berkeley Springs. “Typically the reason we have moved from a location — either it didn’t perform or we were not able to expand the footprint of the property to facilitate our current design,” Dinges said. The new Sheetz at the corner of Rt. 13 and US 522 opened in May. When will Sheetz start marketing the property? Dinges says the old Sheetz is “an internally owned store” — some internally owned entity of Sheetz or a family member owns it. The old Sheetz opened at the corner of Rt. 9 and US 522 in August 1985.